From law-violating subatomic particles to entirely new, earth-like worlds, 2011 was an incredible year for scientific discovery. 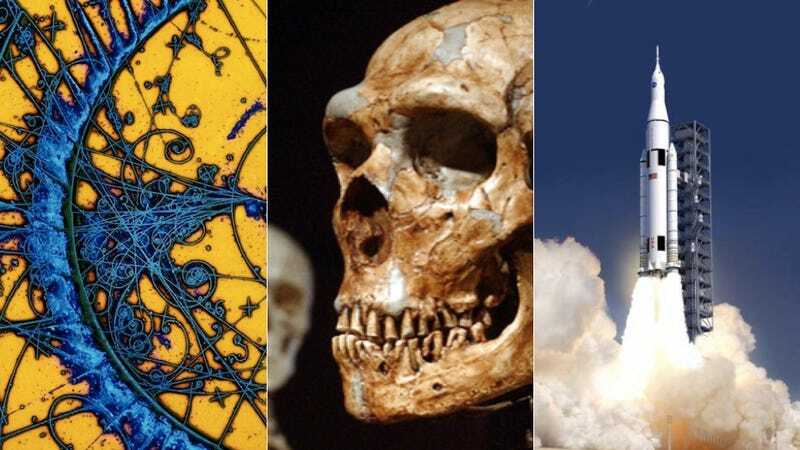 In the past 12 months, scientific breakthroughs in fields ranging from archaeology to structural biochemistry have allowed humanity to rewrite history, and enabled us to open to brand new chapters in our development as a species. With a density of less than one milligram per cubic centimeter (that's about 1000 times less dense than water), this surprisingly squishy material is so light-weight, it can rest on the seed heads of a dandelion, and is lighter than even the lowest-density aerogels. The secret — to both its negligible weight and its resiliency — is the material's lattice-like structural organization, one that the researchers who created it liken to that of the Eiffel Tower. It could be the first step towards truly immersive virtual reality, one where you can actually feel the computer-generated world around you. An international team of neuroengineers has developed a brain-machine interface that's bi-directional — that means you could soon use a brain implant not only to control a virtual hand, but to receive feedback that tricks your brain into "feeling" the texture of a virtual object. Already demonstrated successfully in primates, the interface could soon allow humans to use next-generation prosthetic limbs (or even robotic exoskeletons) to actually feel objects in the real world. In July of 2011, NASA's Dawn spacecraft entered the orbit of Vesta — the second largest body in our solar system's main asteroid belt. Just a few days later, Dawn spiraled down into orbit. Upon reaching an altitude of approximately 1700 miles, the spacecraft began snapping pictures of the protoplanet's surface, revealing geophysical oddities like the triplet of craters on Vesta's northern hemisphere — nicknamed "Snowman" — featured here. Dawn recently maneuvered into its closest orbit (at an altitude averaging just 130 miles). It will continue orbiting Vesta until July of 2012, when it will set a course for Ceres, the largest of the main belt asteroids. 2011 was a fantastic year for NASA's Kepler Mission, which is charged with discovering Earth-like planets in the so-called "habitable zone" of stars in the Milky Way. Kepler scientists announced the discovery of the first circumbinary planet (i.e. a planet with two suns, just like Tatooine); located the first two known Earth-sized exoplanets; quadrupled the number of worlds known to exist beyond our solar system; and spied Kepler-22b — the most Earth-like planet we've encountered yet. And here's the really exciting bit: Kepler is just getting warmed up. In a few years, you may never have to recharge your phone again — provided part of you keeps moving. Back in March, scientists announced the world's first viable "nanogenerator" — a tiny computer chip that gets its power from body movements like snapping fingers or - eventually - your heartbeat. The researchers can already use the technology to power a liquid crystal display and an LED, and claim that their technology could replace batteries for small devices like MP3 players and mobile phones within a few years. Back in September, UC Berkeley neuroscientists demonstrated their ability to use advanced brain-imaging techniques to turn activity in the visual cortex of the human brain into digital images. So far, the researchers are only able to reconstruct neural equivalents of things people have already seen — but they're confident that other applications — like tapping into the mind of a coma patient, or watching a video recording of your own dreams — are well within reach. Researchers investigating Blombos Cave in Cape Town, South Africa uncovered the oldest known evidence of painting by early humans. Archaeologists discovered two "kits," for mixing and forming ocher — a reddish pigment believed to be used as a dye. The find pushes back the date by which humans were practicing complex art approximately 40,000 years, all the way back to 100,000 years ago. Foldit is a computer game that presents players with the spatial challenge of determining the three-dimensional structures of proteins, the molecules comprising the workforce that runs your entire body. In diseases like HIV, proteins known as retroviral proteases play a key role in a virus's ability to overwhelm the immune system and proliferate throughout the body. For years, scientists have been working to identify what these retroviral proteases look like, in order to develop drugs that target these enzymes and stymie the progression of deadly viral diseases like AIDS. It was a scientific puzzle that managed to confound top-tier research scientists for over a decade... but Foldit gamers were able to pull it off in just three weeks. "The ingenuity of game players," said biochemist Firas Khatib, "is a formidable force that, if properly directed, can be used to solve a wide range of scientific problems." Some of the first hard genetic evidence that early Homo sapiens got busy with Homo neandertalensis actually came in 2010, but it was experimental findings published in July of 2011 that really drove the point home. But don't worry — there's still plenty of research to be done on everything from the details of human/neanderthal culture, to the enduring significance of Neanderthal genes in the modern human genome, to the mysterious humanoids, Denisovans. Back in February, IBM's Watson made history by trouncing Jeopardy champs Ken Jennings and Brad Rutter in an intimidating display of computer overlord-dom. But to compare Watson's computing power to the complexity of a brain would still constitute a pretty epic oversimplification of what it means to "think" like a human, as the way each one processes information could not be more different. Watson is impressive, to be sure, but in August, IBM researchers brought out the big guns: a revolutionary new chip design that, for the first time, actually mimics the functioning of a human brain. Currently in transit to the Red Planet, NASA's Mars Science Laboratory — aka the Curiosity rover — was launched on November 26th. The rover is scheduled to touch down on Mars inside the mysterious Gale crater in August of 2012. Once it's made landfall, Curiosity will make use of one of the most advanced scientific payloads we've ever put in space to assess whether Mars ever was, or is still today, an environment able to support life — a mission that could redefine the way we think about life in our solar system and beyond. Radar systems that can see through walls (aka "wall-through" radar systems) aren't unheard of, it's just that most of them are burdened by limitations (like a prohibitively low frame rate, or a short range of operation) — that make their use in real world settings pretty impractical. But that could soon change in a big way. The team of MIT researchers featured in this video has developed a device that can provide its operators with real-time video of what's going on behind an eight-inch-thick concrete wall — and it can do it from up to 60 feet away. Engineers John Rogers and Todd Coleman say that their epidermal electronic system (EES) — a skin-mountable, electronic circuit that stretches, flexes, and twists with the motion of your body — represents a huge step towards eroding the distinction between hard, chip-based machines and soft, biological humans. Two independent teams of researchers recently engineered highly virulent strains of H5N1, more commonly known as the avian flu virus. On one hand, the researchers' work is absolutely vital, because it allows us to get a head start, so to speak, on understanding viruses that could one day pose a serious risk to public health. On the other hand, there are many who fear that findings from such research could be used to malevolent ends were they to wind up in the wrong hands. Included in the latter camp is the federal government, which went to unprecedented ends to make sure that the experimental methods behind creating the strains never made it to the pages of either Nature or Science. Regardless of your position, the development of these strains raises important questions about the nature of dual-use research, transparency, and censorship. It's been a long, long time coming, but earlier this month, representatives from the Large Hadron Collider's two largest experiments — ATLAS and CMS — announced that both research teams had independently uncovered signals that point to the appearance of the Higgs boson — the long-sought sub-atomic particle thought to endow all other particles with mass. "Given the outstanding performance of the LHC this year, we will not need to wait long for enough data and can look forward to resolving this puzzle in 2012," explained ATLAS's Fabiola Gianotti. If the puzzle is resolved with the discovery of the Higgs, it will represent one of the greatest unifying discoveries in the history of physics. By now, the neutrinos that were supposedly caught breaking the cosmic speed limit in Gran Sasso, Italy need no introduction. Scientists the world over continue to offer up critiques on the OPERA collaborative's puzzling results, especially in light of the team's most recent findings — acquired from a second, fine-tuned version of the original experiment — which reveal that their FTL observations still stand. Final Proof that Faster-Than-Light Neutrinos are Impossible? Of course, the most rigorous, telling, and important tests will come in the form of cross-checks performed by independent research teams, the results of which will not be available until next year at the earliest. And while many scientists aren't holding their breath, the confirmation of FTL neutrinos could very well signal one of the biggest scientific paradigm shifts in history.